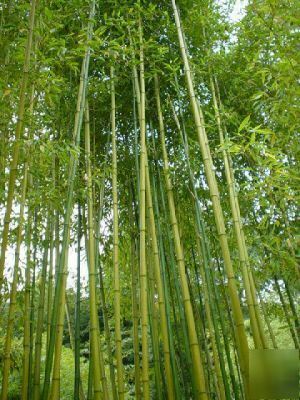 This is one of the most versatile and popular temperate running bamboos that we sell. It makes a medium to dense screen, is a moderate runner and tolerates a very broad range of growing conditions. It is very cold resistant but still does very well in hot temperate climates. It has outstanding form, leaf shape, wood and shoot quality. It is extremely drought tolerant but will also thrive in wetter climates. It will take alkaline as well as acidic PH soils. Although not the largest of the timber species, it will still attain quite impressive sizes. The is the one species that I readily recommend as you can't go wrong with it. These are 100 plants that are in #2 nursery pots (8"), very well rooted with one to several culms per pot and are apx. 4' to 6' + in height. They are landscape ready or can be moved into larger pots. * Maximum culm diameter: 3.5"